How is it already October? It feels like we were putting the final touches on plans for our first week of classes yesterday! We’re already in our fourth full week of classes, planning for Halloween and Holiday events, and beginning our detailed plans for Recital in June. 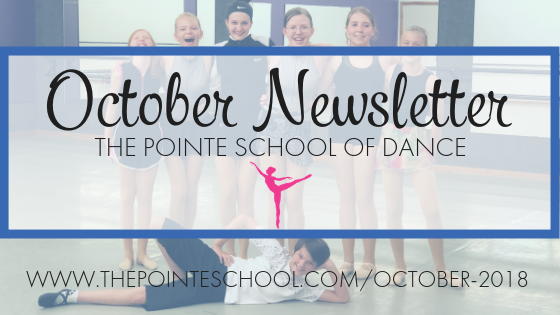 Later this month, recital classes will learn about their music and costumes for recital, PSD dancers will have a blast in the Halloween parade downtown, and we’ll start preparations in class for our Holiday Show. As we continue through the busy fall, I hope you know how much we love working with your kids in classes each week. We are so fortunate to get to do what we love with the best families in Cedar Rapids! This newsletter contains lots of important information you’ll need to make the most of your experience at The Pointe this month and throughout the fall season. Please read it thoroughly and save for reference! Dance with The Pointe in the CR Halloween Parade! Dancers age 6+ are invited to join us dancing in the CR Halloween Parade in the NewBo district. Last year, we had a blast in the parade and would love to have your dancer join us! Details for rehearsal times, etc. are on the signup form here: https://goo.gl/forms/6OdsMc1ubJ0aD6R42 – register by October 9! Discover Dance Days at The Pointe – Next Week! For the week of October 8-13, classes with open spaces are open for the community to come see what we’re all about and for dancers to give an additional class a try! Curious about how adding a second ballet class each week could help your dancer grow, or trying a new style? Have you wondered what Lyrical or Acro or Hip Hop was like, and thought about trying it? Discover Dance Days is your chance to give those classes a try, too! If you placed an order in our online PSD apparel store, we have your orders ready for pick up at the front desk! We have a few extra pieces in the Dance Shop. If you missed the order deadline, stop in any time! We have limited sizes and styles in stock – come in soon for the best selection. Get a FREE PSD Car Decal! The last week of October is so much fun! Stay tuned to our Facebook page to see the recital costumes for each class – we will post a fun guessing game in the morning each day, and reveal the costumes for every class in class and then later online each night! Dancers can wear their Halloween costume, or an old dance costume (as long as they can dance in it!) to class for this super fun week! Instructors will be revealing the recital music and costumes for each class this week! Did you see our Dancers of the Month for September? Read about these awesome dancers here. We’re also doing a fun Senior Feature & Staff Feature each month to help our growing studio learn more about the students who have made The Pointe their home away from home throughout high school and the staff who really makes our studio the special place that it is. We primarily communicate through email – please add info@thepointeschool.com to your “safe senders” list, check emails regularly, and read them thoroughly. View our policy page for makeup class policies, tution and costume payment breakdowns, and more here. Thank you again for your support of our studio and community. We are having a great fall season, and are so thankful that you’re a part of it!